The Twelfth Edition of Knox and Schacht's CHOICES IN RELATIONSHIPS helps students see how positive outcomes in personal relationships depend on making intelligent choices. The authors encourage students to explore the tradeoffs involved with choices, show how to view situations in a positive light, and demonstrate that not making a choice is really a choice after all. 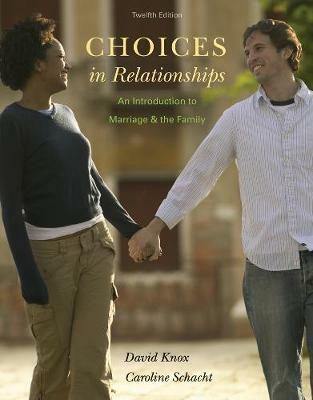 Through current data, an engaging writing style, interactive pedagogy such as self-assessments, and an emphasis on social policy issues within the context of each chapter, this theme-based marriage and family text encourages lively classroom discussion and demonstrates how research and theory apply to students' lives. As a result, students learn to approach every intimate relationship with the new freedom and new responsibility that accompany their choices. This streamlined twelfth edition also includes new discussions of the future of marriage and the family, and features an abundance of new research.